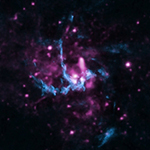 Since its launch in 2008, the Fermi satellite has been observing the entire sky in gamma-rays. It has discovered thousands of previously unknown gamma-ray sources, among which are possibly hundreds of yet undiscovered pulsars – compact and rapidly rotating remnants of exploded stars. Identifying these new gamma-ray pulsars, however, is computationally very expensive – wide parameter ranges have to be “scanned” at very high resolution. “Our innovative solution for the compute intensive search for gamma-ray pulsars is the combination of particularly efficient methods along with the distributed computing power of Einstein@Home,” says Holger Pletsch, Independent Research Group Leader at the Max Planck Institute for Gravitational Physics (Albert Einstein Institute/AEI), and lead author of the study. “The volunteers from around the world enable us to deal with the huge computational challenge posed by the Fermi data analysis. In this way, they provide an invaluable service to astronomy,” says Pletsch. Think you can figure out a way to unlock one of the biggest secrets of the universe? The recently launched third Gravitational Lensing Accuracy Testing challenge (GREAT3) is giving researchers the opportunity to do just that. GREAT3, which is led by Carnegie Mellon University’s Rachel Mandelbaum and UCL’s (University College London’s) Barnaby Rowe, invites researchers from many fields, including astrophysics, statistics and machine learning, to test new and existing methods for measuring weak gravitational lensing. Weak gravitational lensing is one of the most direct – but also most difficult – ways scientists have to learn about the mysterious invisible dark matter and dark energy that dominates our universe. “In previous challenges, people have come up with entirely new methods for measuring weak gravitational lensing that we are using in practice today. 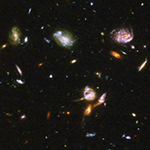 We’re excited to think about what people will come up with in this challenge, and to think about what new information we’ll learn about existing methods for measuring weak lensing,” said Mandelbaum, who is an assistant professor of physics and member of the McWilliams Center for Cosmology at Carnegie Mellon. During an intensive commissioning run, Hyper Suprime-Cam (HSC), mounted at prime focus on the Subaru Telescope, has successfully imaged the Comet ISON (C/2012 S1) as it journeys toward the Sun. Especially striking in the HSC image are the comet’s long tails, which span a distance more than twice the diameter of the full moon. The observation took place in the early morning of November 5, 2013 in Hawaii during a test of non-sidereal tracking, which follows an object that moves at a different rate than the stars. Since Solar System objects such as comets and asteroids appear to move faster than more distant stars and galaxies, they require this special mode of telescope tracking, which allows observers to keep the target in view. An additional challenge for tracking Comet ISON was its low altitude of less than 30 degrees. Nevertheless, the commissioning team was able to capture a clear image of the comet and its tails, including their faint parts, which extend more than one degree away from the Sun. At the time of the observation, Comet ISON was 170 million kilometers from the Earth and 130 million kilometers from the Sun. The difference is important; astronomers develop theories of star motions to not only understand how the stars in our galaxy are moving today but also how our galaxy formed and evolves. The Milky Way is shaped like a spiral, with a region of stars at the centre known as the “bar,” because of its shape. In the middle of this region, there is a “bulge” that expands out vertically. Comet ISON, anticipated by skywatchers for more than a year, is brightening fast just days from its fateful hairpin swing on November 28th around the broiling surface of the Sun. The comet is now a greenish-white fuzzy “star” in binoculars, low in the east-southeast at the beginning of dawn. Telescopic photos are showing it with a long, ribbony tail. The comet has flared with unexpected outbursts of gas and dust three times already this month. It all depends on what happens to the comet’s tiny nucleus, its only solid part. A comet’s nucleus is a dirty iceball that’s just a pinpoint by astronomical standards — in this case less than a mile or two across. As it flies in from the cold outer solar system and warms in the heat of the Sun, some of its ice evaporates, releasing gas and dust that expands by thousands or even millions of miles to become the comet’s glowing head (“coma”) and tail.